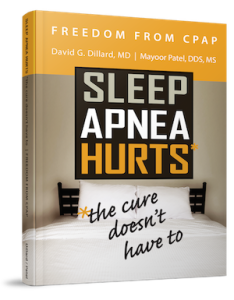 Dr. Mayoor Patel recently has his book, “Freedom from CPAP: Sleep Apnea Hurts, the Cure Doesn’t Have To,” published with the help of Dr. Dillard. If you have picked up this educational book on sleep apnea, or even multiple copies, now what? It’s simple. With the availability of Dr. Patel’s educational book on sleep apnea, you can help your patients get the care they need through better understanding. Let’s take a look at a couple ways you can use Dr. Patel’s educational book on sleep apnea to help your patients and staff. One of the main purposes of this sleep apnea book is to get your patients “in the know” with sleep apnea and what it is. By understanding sleep apnea, your patients can take proactive steps toward better health. Whether you sell this book to your patient, or give it to them, allow your patient to read this book for further knowledge of sleep apnea and treatment options available. The goal of this book is to educate patients on what is sleep apnea and treatment options other than CPAP that are currently available for comfortable care. “Freedom from CPAP: Sleep Apnea Hurts, the Cure Doesn’t Have To,” can also be a beneficial tool for your office. Supply this book for your team, or have them purchase the book to improve their knowledge and understanding of sleep apnea. While it is important for patients to understand this condition, it is even more important for your dental office to know sleep apnea, what it is and how to treat it. Knowledgeable staff members go a long way in helping with diagnosis and treatment of your patients. Take charge of your office and your patients’ health by providing, “Freedom from CPAP: Sleep Apnea Hurts, the Cure Doesn’t Have To.” The more your patients and staff know, the better they are equipped to take the next steps in sleep apnea recognition and treatment. To purchase, “Freedom from CPAP: Sleep Apnea Hurts, the Cure Doesn’t Have To,” please visit: http://www.amazon.com/Freedom-Cpap-Sleep-Apnea-Doesnt/dp/1483423832/ref=sr_1_1?s=books&ie=UTF8&qid=1424297655&sr=1-1&keywords=freedom+from+cpap.